INFORMATION ON THIS PAGE UPDATES FREQUENTLY IN JULY, AUGUST, DECEMBER & JANUARY. PLEASE CHECK BACK FREQUENTLY. View our campuswide events calendar for more Move-In Weekend fun and follow on Facebook. Please know your room assignment prior to showing up at campus. Your student can check their assignment by using their NMSU credentials to sign into MyHousing. Enter campus at Jordan off University Ave. (map below). Volunteers with carts will be available in these locations during the specified time frames. Arrivals may occur from 8:00am-4:00pm each day, but no additional volunteer help will occur after 4:00pm. After 4:00pm, Residence Hall check-in for all halls (Garcia East, Garcia West, Piñon & RGH) will move to the Garcia Hall Service Desk. All Community Meetings for new residents are scheduled at 7:00pm. Resident Assistants will help residents know where to be. Rhodes-Garrett-Hamiel residents will enter campus at Jordan next to Barnes & Noble (identified by the crimson arrow above). Click image to download a printable PDF. Enter campus at Triviz Dr. off University Ave. (map below). Volunteers with carts will be available in these locations during the specified time frame. Arrivals may occur between 8:00am-4:00pm; however, no additional volunteer help will be available outside of these times. Check-ins at the Garcia Hall Service Desk will stop by 10pm and resume again Sunday, Aug. 12, at 8:00am. Garcia & Pinon residents will enter campus at Triviz under the Pan American Center digital marquee billboard (identified by the crimson arrow above). Click image to download a printable PDF. Cervantes Village residents may arrive at the Aggie Express Building at the corner of Williams & Standley for check-in between 8:00am-4:00pm each day. We will have volunteers providing carts, but because you can park right outside the door, physical assistance to move belongings into your apartment is not provided. Check-ins after 4:00pm wil move to the South Campus Service Desk located at the SC Residential Life Office at 1400 Center Drive in Las Cruces, NM 88003. Check-ins at the South Campus Service Desk will stop by 10pm and resume again Monday, Aug. 13, at 8am. Click image to download a printable PDF. Please know your apartment assignment prior to showing up at campus. Your student can check their assignment by using their NMSU credentials to sign into MyHousing. 8:00am-4:00pm: All Cervantes & Vista Del Monte residents may arrive at the Aggie Express Building at the corner of Williams & Standley. We will have volunteers providing carts, but no physical assistance moving your belongings into your apartment. Cervantes & VDM residents meet at Aggie Express at 3555 Williams Ave. between 8am-4pm on Aug. 12. Go to the South Campus office at 1400 Center Drive if arriving after hours. Click image to download a printable PDF. Check-In starts at 8:00am, Sunday, Aug. 12. Check-ins after 4:00pm will move to the Chamisa Service Desk located at the Chamisa Club House. Check-ins at the Chamisa Service Desk will stop by 10pm and resume again Monday, Aug. 13, at 8:00am. Chamisa Village is located at 1725 Stewart Street. The clubhouse is located in the middle of all of the individual buildings as indicated on this map. Click image to download a printable PDF. To help ensure a smoother experience for students and parents, ALL campus residents will check-in at the specific hall you have been assigned. There will be plenty of signage and volunteers to help guide you in. From there, simply follow the signs that will direct you to your specific check-in parking location. Cervantes & Vista Del Monte residents will enter campus by turning south onto Triviz off of University Ave. and then following the road around to Williams. Turn right on Williams until you come to Standley. Aggie Express is on the corner. Residents arriving after 4:00pm on Aug. 12 should report directly to the South Campus Residential Life Office & Operations Center at 1400 Center Rd. Greek residents will check-in with Cervantes residents at Aggie Express (on Aug. 12) or at the South Residential Life Office after hours. Chamisa Village residents will be directed to a parking area near the building for check-in. Check-ins after 4:00pm on Aug. 12 should report directly to the Chamisa Club House at 1725 Stewart St., Las Cruces, NM 88003. 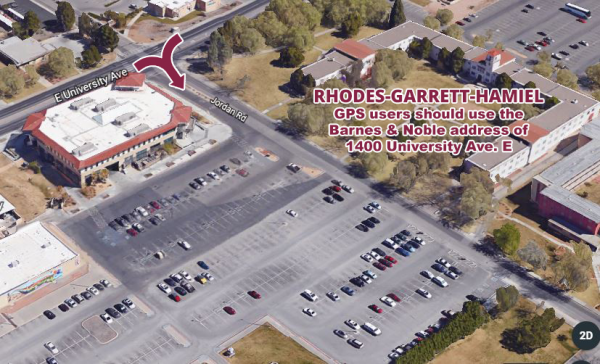 Rhodes-Garrett-Hamiel residents should turn south on Jordan Street from University Ave. at Barnes & Noble. Garcia Hall & Pinon Hall residents should turn south on Triviz off of University Ave. and enter campus under the Pan American Center digital billboard marquee. Signs will then guide you in the rest of the way. Signs and volunteers will guide you to your designated Check-In parking lot. Please be sure to bring your Aggie ID Card (or another form of photo ID) with you in order to obtain your key. In Piñon, RGH, Garcia and Chamisa Village, your Aggie ID Card provides access to the exterior doors/gates. Room and mailbox keys will be issued as part of the Check-In process. Aggie ID Cards are issued though the NMSU ID Card Office. Avoid delays by obtaining your Aggie ID Card before you arrive on campus. The ID Card Office will open at 8:00 a.m. on Move-in Day. At Check-In, you’ll receive unloading directions and instructions. Volunteers will be on hand to assist you with your move. Signs and volunteers will guide you to your designated Check-In parking lot. Please be sure to bring your Aggie ID Card (or another form of photo ID) with you in order to obtain your key. Room and mailbox keys will be issued as part of the Check-In process. Aggie ID Cards are issued though the NMSU ID Card Office. Avoid delays by obtaining your Aggie ID Card before you arrive on campus. The ID Card Office will open at 8:00 a.m. on Move-in Day. We will have volunteers providing carts, but no physical assistance moving your belongings into your apartment. Early Arrival: Early check-in requests will be considered on a case-by-case basis for students participating in organizations or events that necessitate arrival before the official Move-In Day. Please complete the Early Arrival/Late Stay Request. Typically early arrival requests must be received prior to August 1, 2018 and at least two weeks in advance of the planned arrival. Early arrival may require payment of a nightly rate from the date of check-in until opening day. Please note that summer school, summer conferences and our facility cleaning schedule all impact our ability to accommodate early arrivals. Late Arrival: If you will be arriving after the first day of classes, please notify our office to ensure your space is held for you. Students or Families Needing Special Assistance for Disabilities: If you need assistance during Move-In Day because of a medical limitation, please call the Housing Office at 575-646-3202 to make arrangements. Know your residence hall or apartment assignment before your arrive. Check here. Keep a file of everything the University sends you and bring it with you to check-in. Move-In Day will be hot; dress accordingly. Garcia Hall, Piñon Hall, Chamisa Village and parts of Vista Del Monte have restricted access to an elevator on Move-In Day. Rhodes-Garrett-Hamiel is two stories, but has no elevator. Cervantes Village has no elevator, but is only one story. Expect some congestion and traffic. “Ask Me” tables will be in each area if you need directions or have questions. While some move-in carts will be provided, there is a limited supply. If you have your own cart, dolly or hand-truck, you might want to bring it along. Limited food service will be available on Move-In Day. Meal plans for students begin with dinner on Move-In Day. If you have not purchased a Meal Plan yet, you may do so online or at ID Card Services located on the lower level of Corbett Center Student Union. Families are invited to enjoy a meal at Taos Restaurant on Friday, Aug. 10, from 5-7pm. Admission will be just $5+tax for those not subscribed to a Meal Plan.